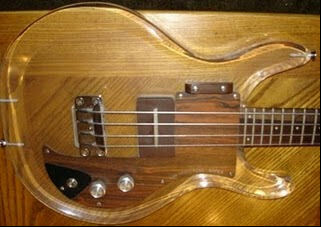 "Superhero Approved: 1969 Dan Armstrong Ampeg Bass." "Howdy! Today we are looking at the bass that Wonder Woman would play if she played bass. Well, and if she was real. It is a 1969 Dan Armstrong Ampeg 4-string bass. These innovative basses were originally built from 1969 to 1971, and are truly the cat’s meow. Daddy-O. Ampeg built these basses (and guitars) in conjunction with Dan Armstrong, who owned a guitar repair shop in New York City. The design he came up with is definitely out there." 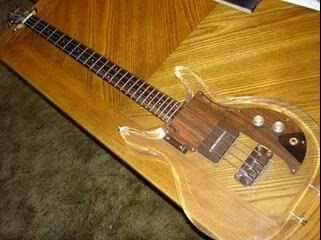 "The most noticeable innovation is that the bodies for these basses are made of Plexiglas. Supposedly this material gives these instruments unbelievable sustain. But, sustain that lasts for days is not exactly the first thing I am looking for in an instrument. Playability and tone come before sustain for me. These are short scale (30-inch) basses, but the maple necks are otherwise conventional with 24 frets and rosewood fretboards. 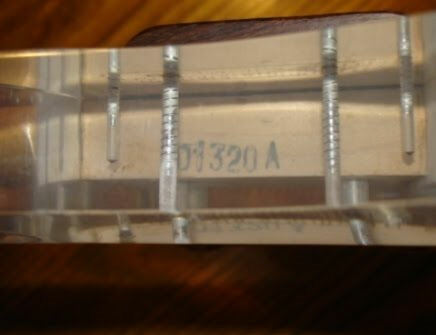 The cutaways allow plenty of access to the upper frets for the more wanky amongst us. Another cool feature of these basses is the interchangeable pickup. These were designed by Bill Lawrence, who happened to share shop space with Armstrong. I have not heard of anybody actually using this feature and swapping pickups around, but it was possible." "The hardware is an odd mixture. 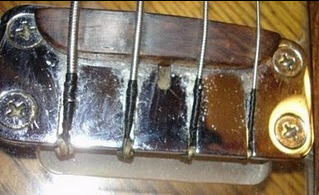 Patent Pending Grover tuning machines were used, and at the other end is a bizarre chrome bridge with a wood nut. The pick guard is a hokey looking wood-grained thing, but it is almost co corny that it is good. 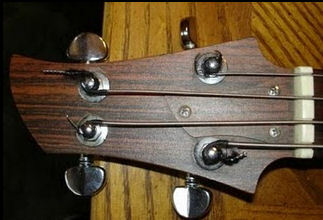 Plus it matches the stuff they covered the headstock with." "This particular bass is one I owned a few years back. It was unmodified, and had no repairs other than the addition of reinforcement at the output jack on the pickguard (where all of these break), as well as a new output jack. There were a few scuffs, but they looked like they could be polished out with a plastic cleaner like you would use on motorcycle or race car windscreens. 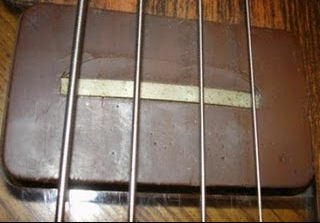 The frets were in prime shape as it was strung with flatwounds when I bought it. Not bad for a 40 year old bass. It played very well and sounded great. I had my guy set it up with roundwounds and it had a surprisingly full tone for such a short-scale bass." "If you are dying to get one of these basses, check on eBay, as there is usually one or two of the originals for sale there Ampeg also re-issued these in 2006, so that could be an option for you too."